1. Chop onion in to large pieces, add onion, pork, black pepper, garlic salt, 2 tbsp paprika, cayenne pepper, and water to slow cooker. Cook on low for 5 hours. Shred the pork and set aside to drain. 2. Mix the chipotle powder and mayonnaise. Cut the ciabata rolls and spread mayo spread on the both sides. Put a layer of cheese and add paprika. 4. Then a generous layer of shredded pork and pickles followed buy the top slice of roll. 5. Toast the sandwich while pressing down firmly with another pan. You can use a sandwich griller if you have one big enough. The point is to really mash it all together to made it bite size and quickly heat all the components of the sandwich. Cubanos are a great Cuban sandwich. The Cubano Sandwich recipe is pretty easy, combining roast pork and ham with other ingredients to make each bite perfect. 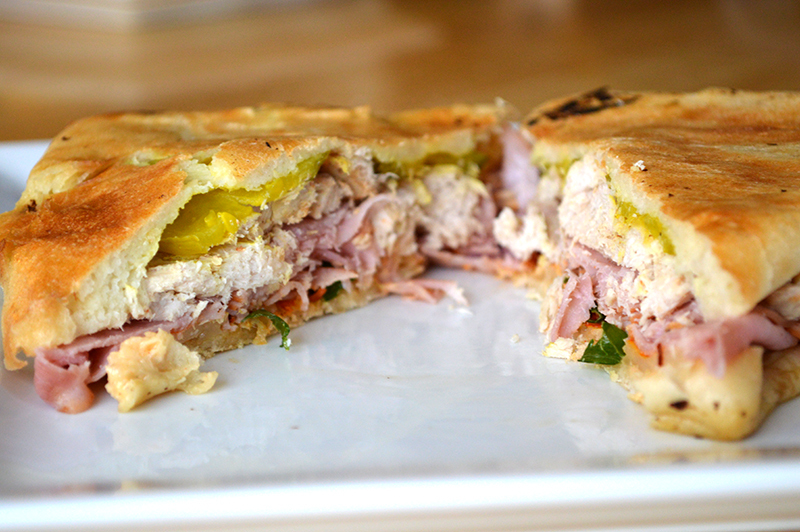 There are a few keys to making a good cubano. First don’t scrimp on the preparation of the roast pork. Second, pick a good bread. You want to go with a hard bread such as french bread, ciabata or a nice italian. Third, let all the ingredients drain well before you try to mash them together, otherwise the bread will fall apart during toasting. Don’t be afraid while building the layers of making it too thick to fit in your mouth, because you’re going to mash it down over heat. These sandwiches go great with some homemade potato chips, fries or even some potato salad.